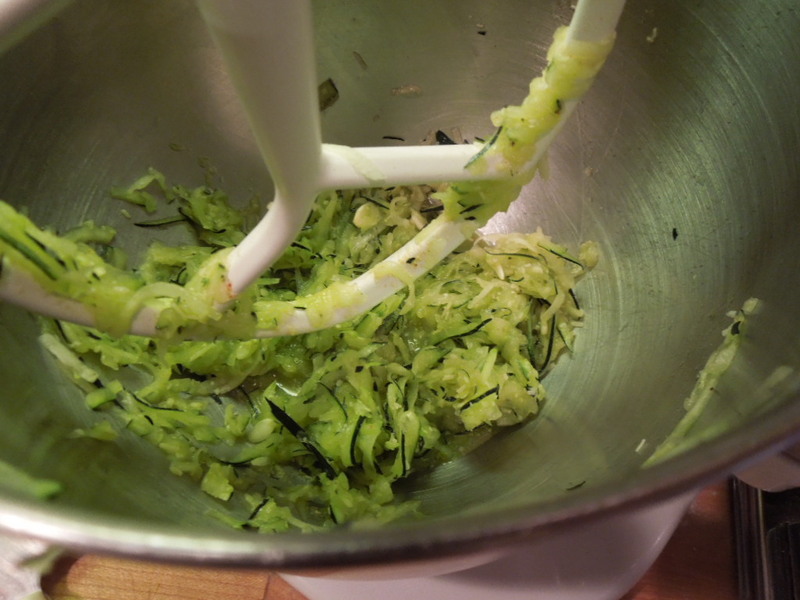 A zucchini recipe that can make a zucchini lover out of anyone! A special thanks to Wil and Lil for sharing the abundance of their garden! What an incredible haul from their nectarine tree, apple tree, zucchini and squash plants. While the picture doesn’t do the larger zucchini justice, trust me when I say it’s almost as long as my arm and maybe even thicker. There is some serious zucchini growing going on in Antioch! Incredible! Zucchini is a challenge for a lot of people. When in season, there is so much of it. But, what do you do with it? How can you even begin to use a zucchini as big as your arm? 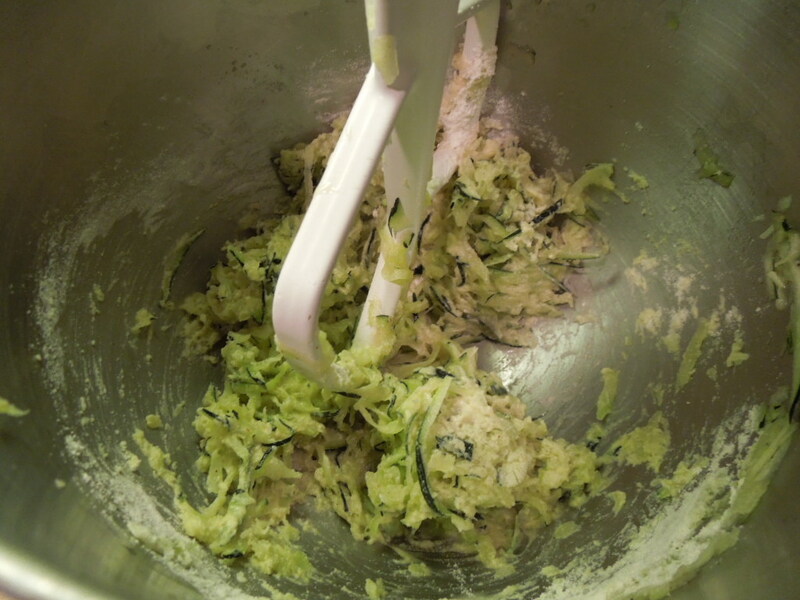 I love it sautéed, fried, twice baked, zucchini bread, zucchini muffins, zucchini pasta – it’s all good. 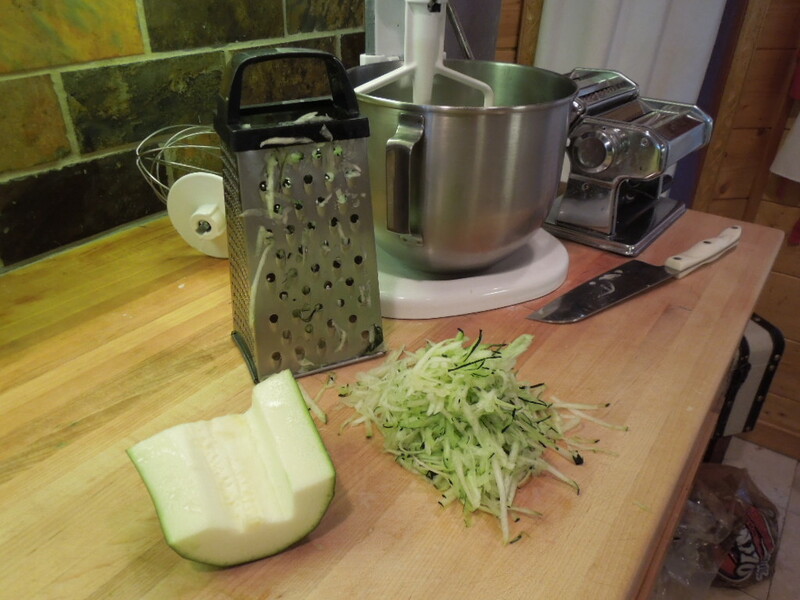 But today, as I was shredding my zucchini for bread, I had this thought – what about zucchini cakes? Like a potato pancake of sorts but with zucchini instead. The result was a totally yummy, super cheap and oh so abundant of an appetizer (this time of year, anyway). Line a dinner plate with two layers of paper towel and set aside for cakes to rest on once cooked. 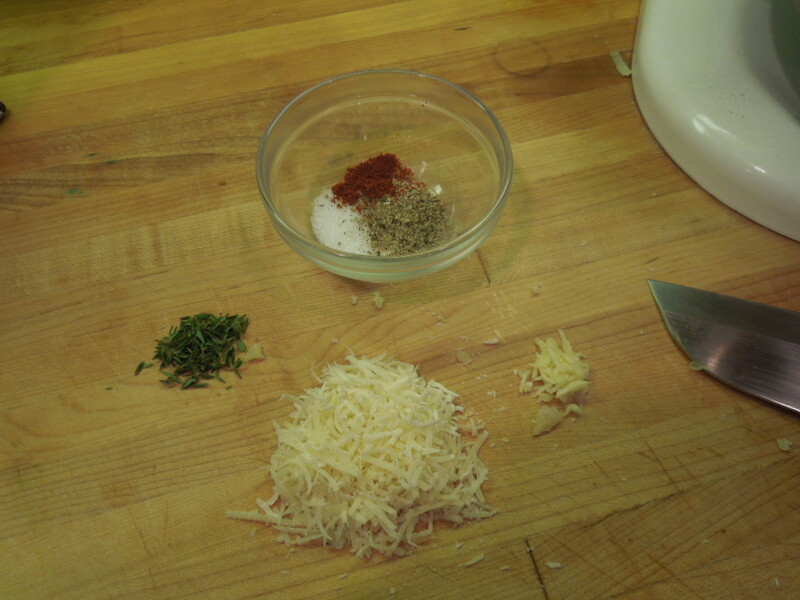 Mix together grated zucchini, salt, pepper, paprika, garlic, and thyme until well incorporated. Let sit a couple of minutes. Drain off excess liquid from bowl. Mix in corn flour to coat evenly. Next, mix in the beaten egg until well combined. Meanwhile, preheat medium sized pan (I like cast iron for this application) to medium heat. Once hot, add in 2 tablespoons of vegetable oil and bring to temperature. 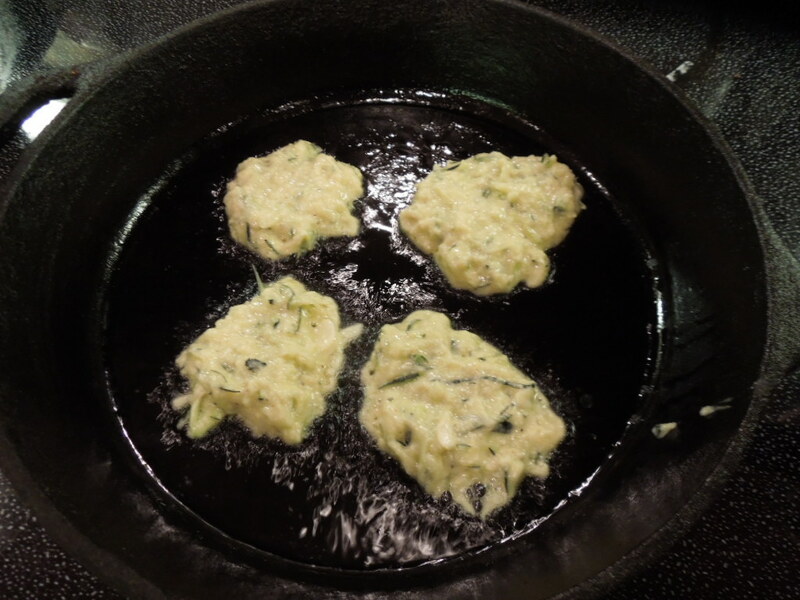 Spoon zucchini batter by tablespoon full onto pan and smooth out with back of spoon to thin cake to around ½ inch. Let cook around 2 minutes on the first side (until edges start to brown and bubbles start to appear near center of cake). Turn cake over and let cook around 2 minutes more, or until golden. 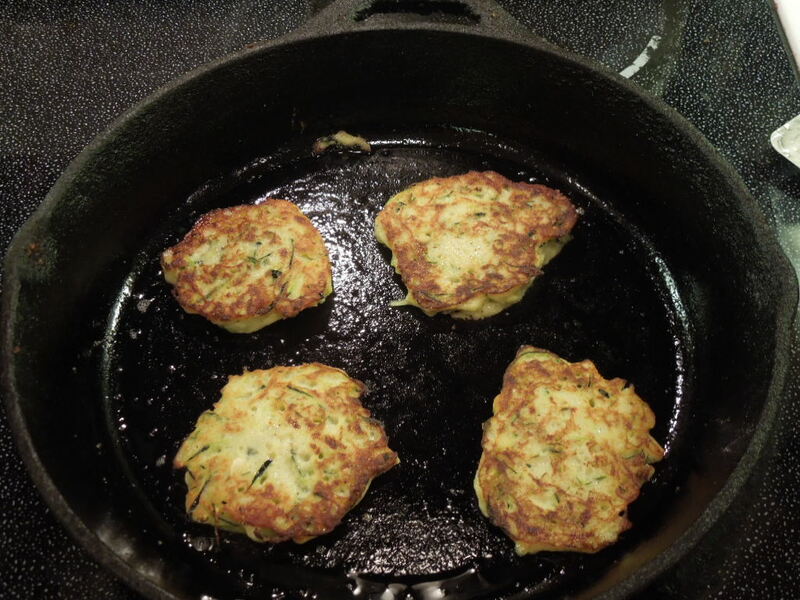 When golden on both sides, place cooked zucchini cakes on paper towel-lined dinner plate. Serve hot with a dollop of sour cream, creme fraiche, yogurt or ranch dressing. This would make a good prep ahead recipe if you combine all ingredients except for corn flour and egg and drain off excess liquid before combining with flour and egg just prior to frying. Don’t forget to dress this recipe up how you want it. Do you want a little sausage? Sautéed onion? Mushroom? Mexican spices? Maybe a little curry? Do it! Just be sure to drain off the excess liquid prior to combining with flour and egg. Make it your own. Did you know that zucchini is an excellent source of vitamins and minerals, is low in calories, high in potassium, protein and fiber and is one of the easiest vegetables to grow? Tags: cheap appetizer recipes, diabetically friendly appetizer, diabetically friendly recipe, easy party recipe, fried zucchini cake with pictures, fried zucchini cakes, fried zucchini patties, good use for zucchini, healthy appetizer, party on a budget, shredded zucchini recipes, vegetarian appetizer, vegetarian recipes, what to make with zucchini, zucchini appetizer, zucchini cake recipe, zucchini cake recipe with pictures, zucchini recipes. Bookmark the permalink.